Awaken your winter-weary palates with springtime salads exploding with flavor and nutrition. The crisp taste of arugula gets a fruity pickup from grapefruit and a zing from a ginger-garlic dressing. The beauty of golden tangerines shines amid the flavors of jicama, radishes and scallions. A piquant tangerine-tequila dressing contributes its own citrus-themed notes to the root vegetables and peppery watercress mix. While you can find grain-based protein bowls popping up in abundance in health food stores and supermarkets, you can easily make your own at home. In our take on the protein bowl, we combine the super-food quinoa with roasted carrots, red onion, avocado and mint for a hearty and healthy dish you’ll want to pack for lunch at the office or create for a weeknight dinner. Celebrate spring with this medley of salads you’ll be eating all season long. Protein bowls are quite popular these days — and for good reason. 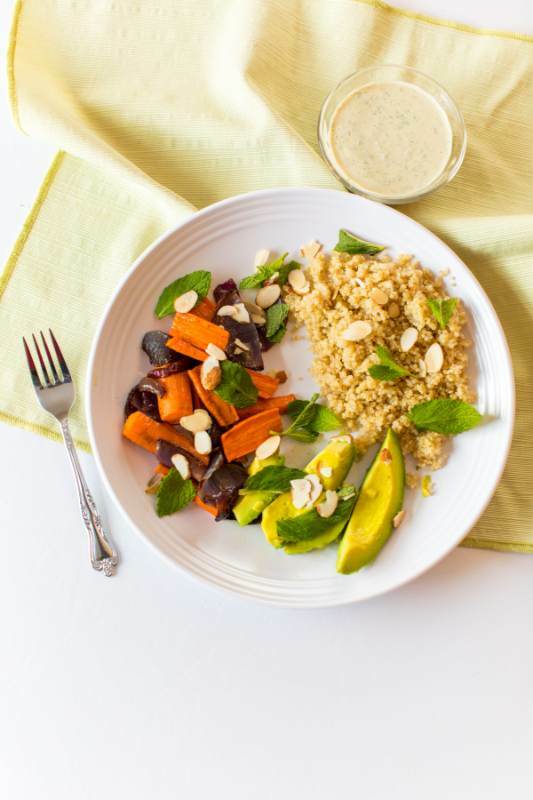 This protein bowl combines quinoa, roasted vegetables and a creamy tahini dressing for a delicious protein-packed main or side dish. In the bowl of a blender or food processor, combine tahini, lime juice, water and mint leaves. Blend or process mixture until smooth. Season dressing to taste with salt and pepper. Set aside. Place a large baking sheet into oven and preheat the oven to 425 degrees F. Remove baking sheet from oven and place carrots and red onion on baking sheet. Drizzle vegetables with olive oil; season to taste with salt and pepper. Transfer baking sheet to oven and roast carrots and onion, turning once, until vegetables are slightly golden and tender, about 20 to 22 minutes. In a small saucepan, combine quinoa with 1½ cups water and a pinch of salt. Bring water to a boil over medium-high heat. Reduce heat, cover and simmer for about 15 minutes. Remove quinoa from heat and let stand for 10 minutes. Fluff with a fork. Divide quinoa equally among serving bowls with roasted vegetables and avocado slices. Sprinkle with slivered almonds and mint leaves. Serve dressing on the side. Makes 4 servings. Jicama is a root vegetable native to Central and South America. To use jicama, you’ll need to peel the paper-like skin to reveal its creamy flesh underneath. Jicama’s distinct flavor is a cross between an apple and a potato. Place the vegetable oil, tangerine juice, tequila, lime juice, honey, garlic, salt and pepper in the bowl of a blender or food processor. Cover and blend ingredients until combined. Transfer dressing to a screw-top jar; cover and chill up to 24 hours before serving. Shake dressing before using. 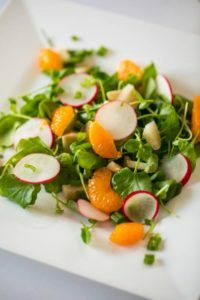 In a large serving bowl, combine watercress, tangerines, jicama, radishes and scallions. Toss with enough dressing to coat vegetables. Serve salad immediately. Makes 4 to 6 servings. 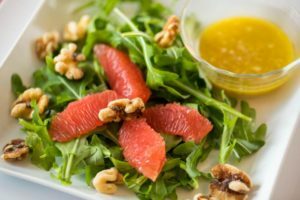 Arugula is full of essential nutrients such as calcium, folate, potassium and vitamins A, C and K. Segments of ruby grapefruit give this salad hints of jewel-like color on the plate. In a small bowl, whisk together ginger, garlic, lime juice, rice vinegar and sugar. Gradually add olive oil, whisking constantly until combined. Set aside. Supreme the grapefruit by removing the peel and pith. Holding peeled grapefruit over a large bowl, cut segments of fruit between the membranes and let fruit drop into the bowl. Squeeze juice from the membranes over the fruit and discard the membranes. Add arugula to mixing bowl. 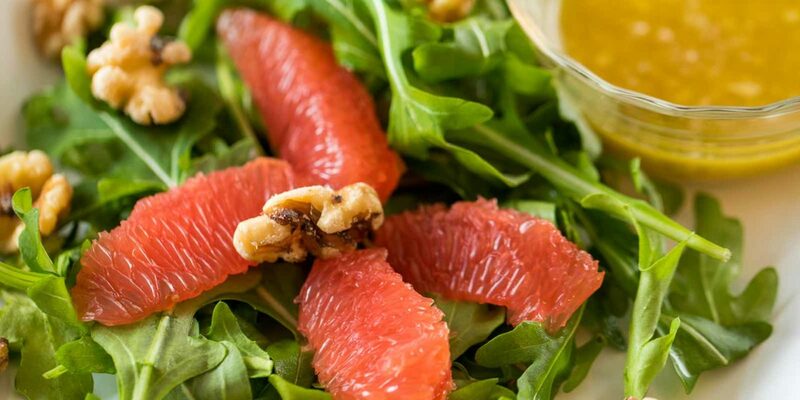 Pour reserved dressing over arugula and grapefruit. Toss to coat with the dressing. Serve salad on individual salad plates. Sprinkle each serving with walnuts; season with coarse salt and black pepper. Makes 4 servings.